For all SD&MicroSD memory card duplicator of Intelligent 9 Series, after updating to firmware v2.31.0 you add and enable the new function-ID Reader at no cost to you. It will take only 3 seconds to accumulate a large number of SD ID including serial number, VID, MID..etc, with pickup repeated ID feature. All detail information will be recorded in TXT file for easy transfer to different format and application. To view detail information from a large number of SD cards is very troublesome since software engineers need quick access information during development (i.e. data encryption). U-Reach have made it easy with the ID-Reader, user is able to get hundreds of SD ID in few seconds. This saves you time, cost, and increased your productivity in the workplace. Q1. Do I need to pay for the ID Reader function? A: No, It is free when you update to the new firmware that will unlock this new ID-Reader function. Q3. What models can add this new function? 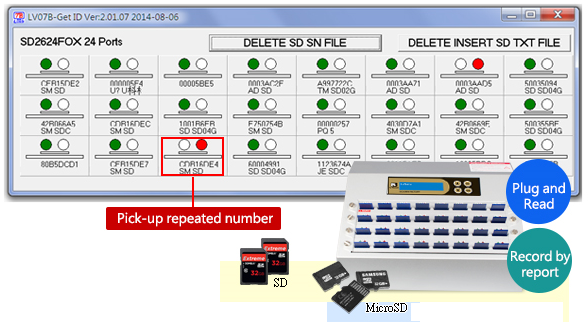 A：All Intelligent 9 ComboSD (SD&MicroSD) models that production after August of 2012 (Serial number after SD924S2190001). Q2. Can source port read the ID information? Q4. Will the ID reader destroy the card data or file structure? A: The ID Reader will only read the SD ID information from the SD card; it will not affect the original data or format of the memory card.